‘A Brief History of the Jews’ Lecture. Join us for the first of our exciting 4 part lecture series – ‘ A Practical Guide to Judaism’. Guest Speaker Rabbi Michael Pollak. 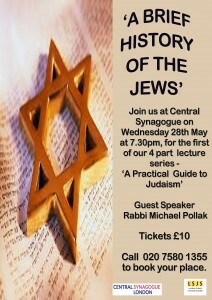 Call the Shul Office on 020 7580 1355 or to book online please click here.